The goalkeeper has been selected to start today. Westwood has struggled to get into the Sunderland team since moving to the club. KEIREN WESTWOOD LOOKS to have won the battle to become Sunderland’s new number one goalkeeper, with Paolo Di Canio picking him to start their first Premier League match of the season against Fulham today. The Irish international, who featured in his national side’s match with Wales during the week, spent most of last season on the bench, owing to the consistently impressive performances of Simon Mignolet. However, Mignolet’s subsequent summer departure to Liverpool meant the number one jersey at the club was up for grabs, but their acquisition of Vito Mannone from Arsenal once again left Westwood’s future uncertain. Nevertheless, Di Canio’s latest move indicates Westwood is set to be Sunderland’s number one for the foreseeable future – a decision which puts him in firm contention to start Ireland’s upcoming World Cup qualifiers, with David Forde already ruled out of the games due to injury. Email “Good news Ireland fans - it looks like Keiren Westwood is Sunderland's new number one ”. 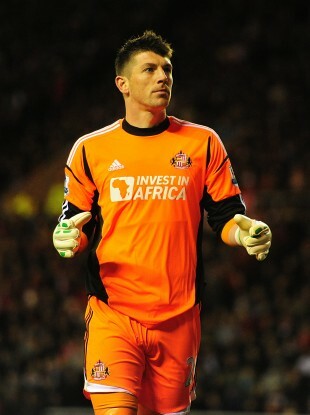 Feedback on “Good news Ireland fans - it looks like Keiren Westwood is Sunderland's new number one ”.